When Buckminster Fuller developed the idea of knowledge doubling — the idea that the knowledge in the world doubles at a predictable and accelerating rate — he proposed that in 1900, human knowledge was doubling every 100 years and by the 1950s, that number had been reduced to 25 years. Today, knowledge doubling can be measured in days or hours, depending on the field. Five years from now, over one-third of skills (35%) that are considered important in today’s workforce will have changed. This massive amount of change is disrupting the way companies work and the way employees develop skills, and it will force you to challenge the status quo on the programs and systems you relied on yesterday. 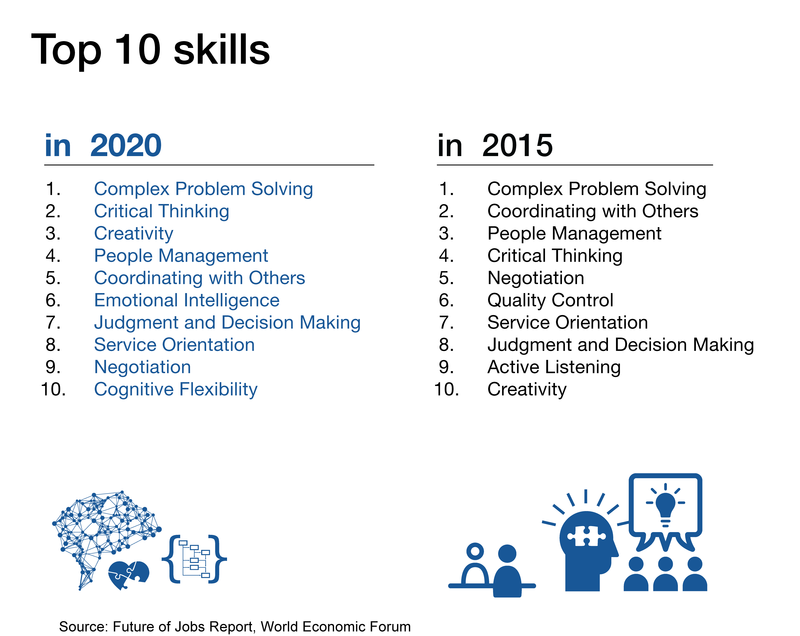 In the information technology area, the appetite for skills, especially in the area of cognitive computing, cloud and blockchain, have created a growing skills crisis. In the United States alone, there are more than half a million open jobs in technology-related sectors in the United States, according to the U.S. Department of Labor. Organizations like IBM are rethinking the requirements for the next generation workforce. “This is not about white collar vs. blue collar jobs, but about the ‘new collar’ jobs that employers in many industries demand, but which remain largely unfilled,” according to Ginni Rometty, Chairman, President and CEO of IBM. When Ginni Rometty coined the term “New Collar,” she changed the conversation in the IT labor market: IBM is focused on skills, not degrees. At any given time, IBM has thousands of job openings in the U.S., including many new collar positions. And over the past few years, new collar IBMers who do not have a traditional four-year degree have accounted for between ten and 15 percent of our U.S. hiring. ‘New collar’ jobs are roles in some of the technology industry’s fastest growing fields – from cybersecurity and cloud computing to cognitive business and digital design – that do not always require a traditional four-year college degree. What they require instead is the right mix of in-demand skill sets. Those skills can be learned through 21st century vocational training, innovative public education programs like P-TECH, which IBM pioneered, coding camps, and training and certificate program, like the programs hosted by IBM Training & Skills. To create a talent pool for its company and clients’ needs, IBM has developed a unique professional certificate program that provides a way to rapidly develop the skills needed to land a job in information technology. The program focuses on new careers as well as upskilling and reskilling and is designed to help unemployed workers or mid-career job changes get into the labor market more quickly. The IT industry is vast and the roles are varied. In many cases, potential candidates have no idea where to begin — or what they may be qualified to do. This program starts with a “pre-training assessment,” using an approach similar to pre-employment assessments used in talent acquisition programs. The goal here is to provide students with a “cognitive career coach” to help guide a student toward a role that is a tight match. Students receive targeted recommendations for the roles in which they will excel. This science-based, non-biased approach assesses cognitive skills, abilities and personality traits to ensure a tight job fit, reduce turnover and increase job satisfaction. in a tight labor market with high turnover rates, these assessments will save employers a significant amount of revenue and will reduce the churn and dropout rates for training and onboarding. Training for the program is developed using a “job task analysis” process which is designed to get a candidate ready to work as quickly as possible. Subject matter experts define the tasks, rank importance and then determine the fastest and best way to achieve and verify competence. By design, this portion of the program is delivered online to provide flexibility and global consistency. Real-world job simulations prepare candidates for immediate hire. Students may take an online proctored exam to receive a New Collar certificate. Online proctored (OP) exams allow students to conveniently and easily take an exam in the comfort of their homes or offices while being monitored by an offsite proctor. Students in the program experience the unexpected side of work that cannot be taught in a classroom. Structured on-the-job evaluation, feedback tools and exams ensure a non-biased approach to develop job candidates. The outcomes are reduced on-the-job error rates and lower job attrition. As students engage in hands-on tasks, they can learn from mistakes without corporate disruption, and live experience provides a preview of the job to ensure the employee is a good match. IBM has incorporated two programs to help match talent with employment. Collaborating with Acclaim, every IBM digital credential is embedded with real-time job postings. Students can open their badges and see job postings which match their skills from a large number of companies. Students can sort by location, salary and titles and then apply for a job directly from within the badge. The program automatically builds a “digital resume” showing a students’ badges and certificates. Students can easily share a URL with an employer to provide a validated, trusted resume. IBM’s Talent Match service gives employers access a searchable opt-in database of training candidates who are eager to connect. Employers can search the database by skills, credentials and locations and send private e-mail messages. And at every step along the way, students can earn IBM digital credentials as signals of employability. IBM has developed a market-leading digital badge program, http://ibm.com/badging and this program takes advantage of that: Students can earn IBM digital badges and IBM Professional Certificates which will help them build compelling online digital resumes. An alternative to a traditional degree? According to CNBC, student loan debt has tripled over the last decade to close to $1.5 trillion and college tuition could nearly double by 2036 to over $300,000. In the IT field, professional certificate programs like IBM’s can provide an affordable alternative to help candidates get the skills they need to get into the workforce quickly. IBM launched its New Collar Certificate Program for Customer Engagement on Coursera in September. Visit the IBM New Collar Certificate site to find out more. David Leaser is the senior executive of strategic growth initiatives for IBM’s Training & Skills program. 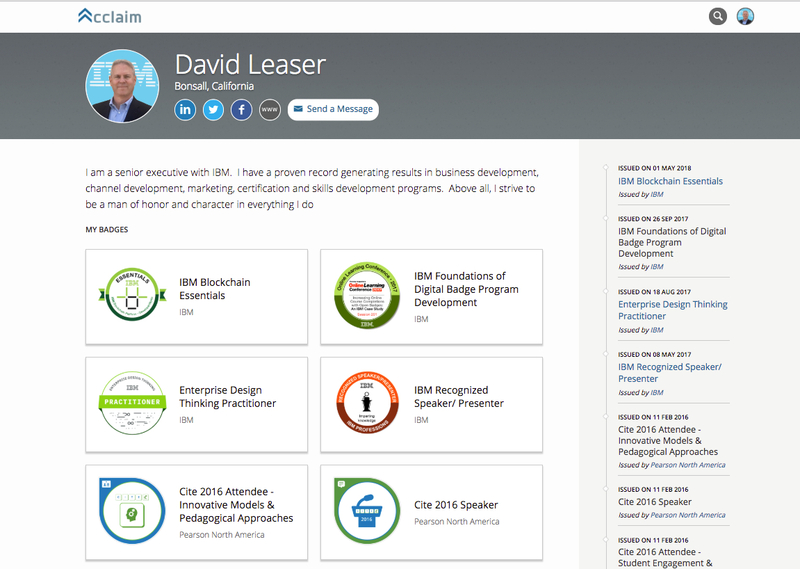 Leaser developed IBM’s first cloud-based embedded learning solution and is the founder of the IBM Digital Badge program. He is a Fellow at Northeastern University and a member of the IMS Global Consortium Board advisory group for digital credentials. He has provided guidance to the US Department of Labor and the US Department of Education as an employer subject matter expert. He holds a B.A. in Communications from Pepperdine University and an M.A. in Communications Management from USC’s Annenberg School. Your Invitation to the Talent Match Pilot!